I'm sorry to announce that Bobby's Tale, as stated will be put onto an indefinite hiatus. 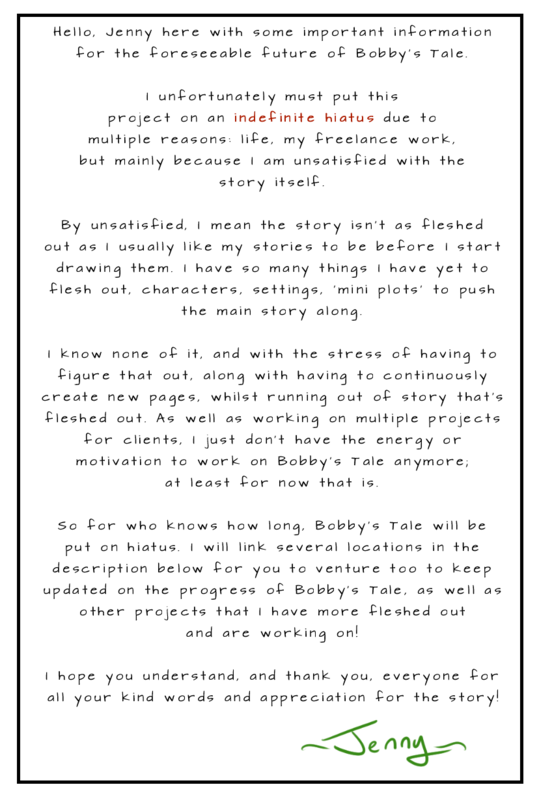 I won't re-explain why here, since it's stated above, but here are places you can find updates on my projects including Bobby's Tale. My personal Tumblr account [LINK] this is where I update most frequently about life and projects. My Bobby's Tale Tumblr [LINK] where I update about Bobby's Tale, but I frequently just reblog the updates from my personal Tumblr. My personal Twitter [LINK] which I update in frequently but I try to partake in the Webcomic Weekly Chat when I remember too hop on! I also still have my Patreon [LINK] with NEW new rewards, such as drawing requests and progression shots of my illustrations and other projects, to even MUSIC REQUESTS! I hope you all understand my reasoning for having to put Bobby's Tale on yet another hiatus. Hopefully the hiatus won't be too long either, but I'm really unsure as of yet how long it will be.